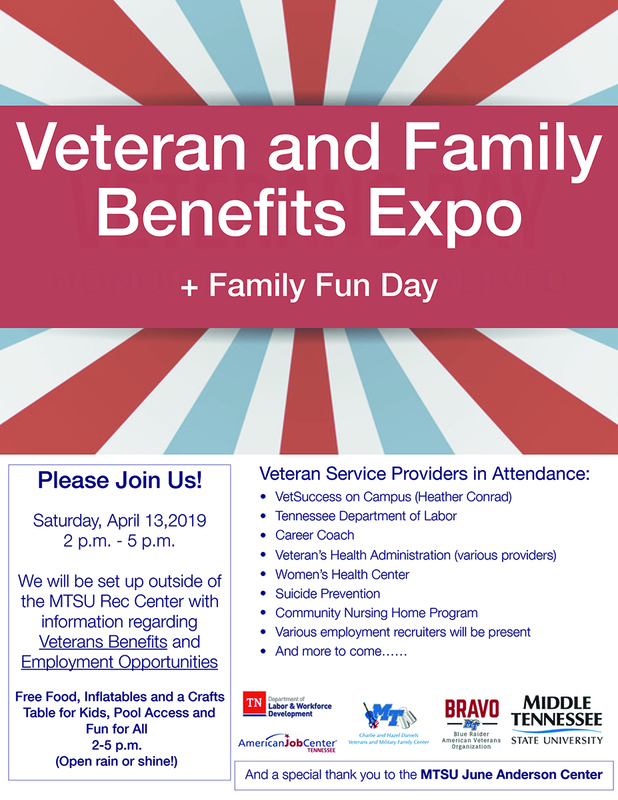 A Veteran and Family Benefits Expo and family fun day will be held from 2 to 5 p.m. Saturday, April 13, outside the MTSU Student Health, Wellness and Recreation Center, 1848 Blue Raider Drive, in Murfreesboro. More than 10 veteran service providers will be on hand with information regarding veterans benefits and employment opportunities. 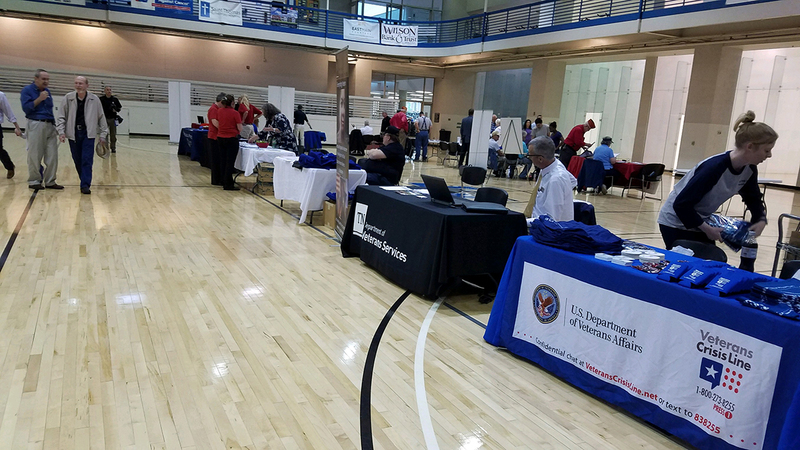 The MTSU Charlie and Hazel Daniels Veterans and Military Family Center holds veteran and family benefits expos to let student veterans and their families learn more about benefits and job opportunities available to them, said Heather Conrad, who is a counselor with the VetSuccess on Campus program. The public and MTSU student veterans community are invited to the free event. To find the event location and parking, visit http://tinyurl.com/MTParkingMap. Veterans Health Administration (various providers). The VA’s Community Nursing Home Program. Free food, inflatables and a crafts table for children will be available. The event will be held rain or shine. In addition to the Daniels Center, other sponsors include the Blue Raider American Veterans Organization, or BRAVO, VetSuccess on Campus and the June Anderson Center for Women and Nontraditional Students. The Daniels Center and VA partnered to bring the first VetSuccess on Campus in Tennessee to MTSU. Conrad and counselors like her provide academic and vocational guidance to veterans and help connect them to other VA benefits, including health care and mental health services. For more information, call 615-898-2974 or email Conrad at Heather.Conrad@va.gov. The Daniels Veterans Center is located in Rooms 124 (main) and 316 (job and career support) of the Keathley University Center, 1524 Military Memorial, in the heart of campus. For more information, call 615-904-8347 or visithttps://www.mtsu.edu/military/.